Another Brand new song inspired by an everyday occurrence – a beautiful Sunset. 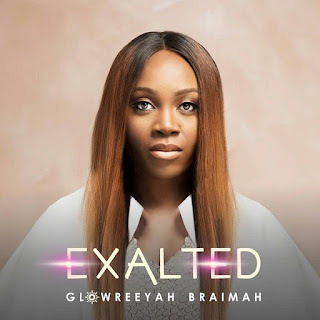 Glowreeyah Braimah releases a new single titled “Exalted” produced by Olaitan Dada for Natialo Productions. “While I was driving to a mall one Saturday evening, I spontaneously started singing ‘Oh my soul, you must arise and see your God exalted’. A wave of ecstatic joy hit me on the spot.I parked my car and right in front of me, I saw the sun setting on the horizon. I got out of my car and lifted my hands out there in the parking lot. The revelation of the moment for me was simple. That sunset showed me that even though the sun in all its glory was going down that evening, it would surely be set to raise the following morning. Our souls carry the life of God. According to the second line of the song, ‘His Spirit-Air is all we breathe’. Our living souls must reflect life, sight and hearing thought and speech, intelligence, and emotions, will and desire, personality, and identity. When your soul is downcast, it loses its essence. Its raison d’être. It's reason for living. Don’t let the troubles of this world, the biased opinions of men, the vicissitudes of life, heartbreak, depression and all kinds of ‘wahala’ rob you of your life, your purpose, your God-spark. Take charge! Command your soul to rising and worship. To see your faithful God exalted as the good God who loves you inspite of what your senses are telling you today.